In light of the forthcoming PARCC test, thousands of districts are scrambling to prepare their students for an assessment that they are not yet prepared to take. What follows is a list of five strategies that promise to heighten students’ readiness by honing in on PARCC-specific skills, increasing their familiarity with PARCC-like learning tasks, bolstering their confidence, and ultimately, supercharging their scores. Do right by your students and prep them using these tips now! 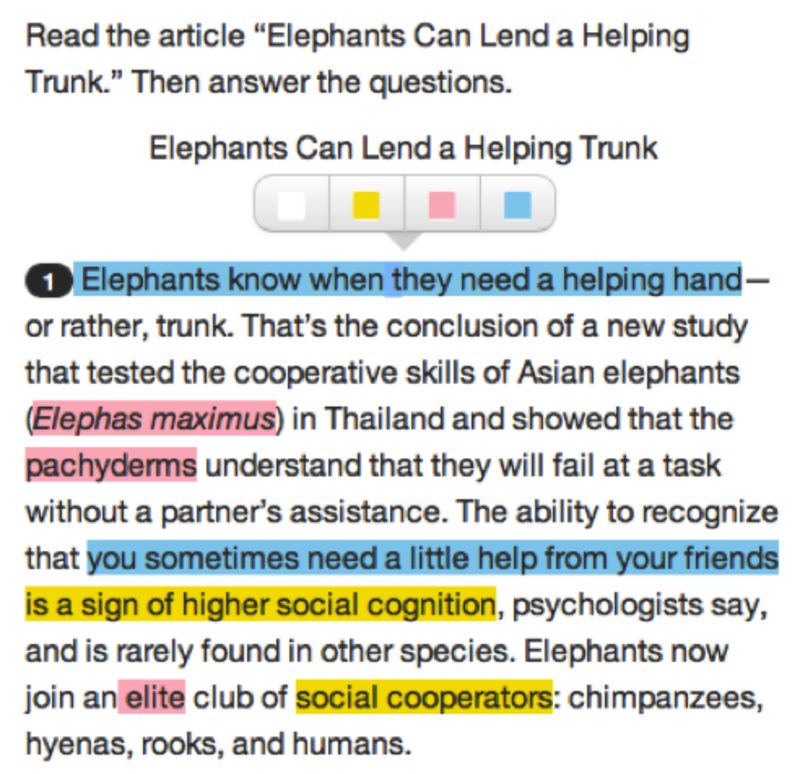 Develop a highlighter color-key for your class – for example, unknown language might be highlighted in red, use of “logos” or factual-evidence might be highlighted in yellow, while phrases intended to generate emotional support might be highlighted in blue. Practice, practice, practice – both on paper and on devices! Use any standard word processor (e.g. Microsoft Word) for independent practice, or explore tools such as Google Docs and Diigo for collaborative analytical highlighting! Make this exercise “standard operating procedure” in your classroom. That means students are introduced to this practice in September and engage with it all year long – when they read novels, when they peruse news articles, when they write essays, and even as a part of class warm ups! Come test day, this will be nothing new. Among the many things PARCC purposes to assess, there is a substantial focus on students’ ability to understand vocabulary in context. These test items come in two parts, the first of which asks students to define a given word while the second demands corresponding textual support. For example: (1) In the context of the second paragraph, what does “modified” mean? (2) How do you know? Always ask students to define words they don’t know without a dictionary! Yes, dictionaries are great tools, but they won’t have one on test day, they won’t have one on job interviews, and they won’t have one when they present their work to a panel of executive board members. Practice the process of defining terms based on contextual evidence alone! Make this fun! Framing this process as a game (i.e. developing “word sleuths”) can go a long way for making this process engaging (rather than tedious). It’s inherently inquiry based, and good fun for growing minds. Practice these strategies using a one-two punch of PARCC-provided tools: the highlighter tool and the notepad tool! Research shows that something as simple as taking a test – without any additional preparation or instruction – enhances students’ performance on subsequent tests. This makes sense on many levels, and provides an authentic opportunity for students to engage with the tools they’ll have on test day. Our advice? Take a test together as a class in order to model effective thinking processes, test-taking strategies, and use of digital tools. Provide students at least one PARCC experience that is as authentic as possible. If it’s feasible, have students take the test in the same room they’ll be in, with the same teacher, in the same seat, on the same device! The most challenging questions on PARCC require students to think rhetorically about the texts they read and/or view. As it happens, this is an area of English/Language Arts instruction that has been largely reserved for AP Language courses and introductory level college classes, rather than mainstream 6-12 education. How various sources seek to convey information? The role that speaker and ethos play in establishing credibility? The various strategies that are being used to manipulate the reader’s position? Use a rhetorical lens with the literature you already teach in your existing curriculum! The rhetorical triangle and simple appeals to ethos, pathos, and logos can create incredible depth when working with both fiction and non-fiction texts. We have done all of the work for you in developing rhetorical analysis lessons and plans for the most popular Middle School and American Literature core novels. Take advantage of our best stuff now! Make rhetorical analysis part of everyday-life in your classroom. Consider the role it can play in any reading, no matter the size. Consider how it might be used as a quickwrite, journal prompt, or overarching essay topic. Our favorite? Rhetorical analysis warm-ups and mini-lessons grounded in popular culture – grounded in these lessons and corresponding video analyses! Be creative and have fun! Rhetorical analysis can be among the most stimulating, engaging, and real-world applicable skills that students can cultivate in your classroom. Use authentic assessments and performance tasks! Engage your students in lively debates! Explore avenues for game-based learning to heighten discussion and critical thinking! The final and perhaps most daunting performance task students will face on PARCC is the “Research Simulation Task.” In short, students will be asked to review three different sources, to think critically about the way they convey information to their target audiences, and to synthesize their analysis in an essay. Our advice for giving your students the sword and shield they need to slay this dragon? Lay the appropriate groundwork and your students will soar! The research simulation task requires your students to be well versed in rhetorical analysis (described in tip #4) and to be comfortable conveying their ideas in writing. The more opportunities for analytical and synthesis writing you can create, the better! Create opportunities for your students to rehearse the task on a digital medium. 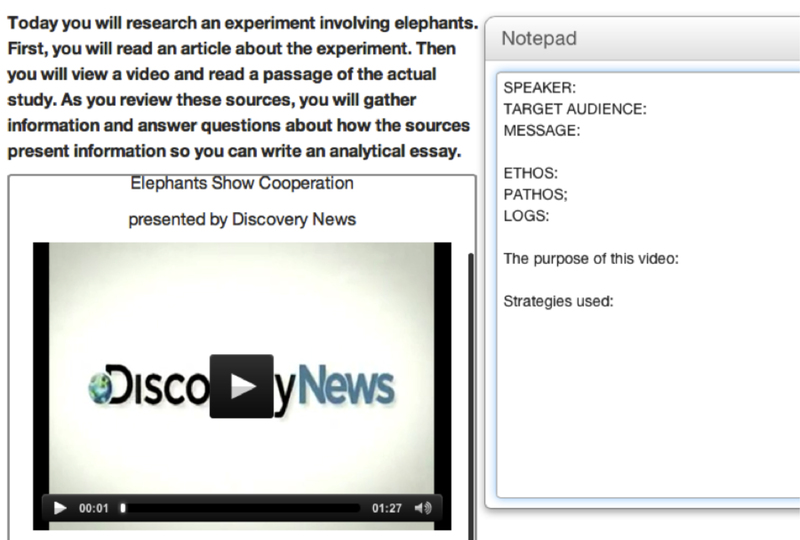 Craft your own research simulation task using three pre-selected sources and a writing prompt. Consider simply pasting the texts into a Google Doc or Word Document and/or hyperlinking students to the sources they will be reading, analyzing, and writing about! Ask students to develop their own research simulation tasks! This creates a wonderful opportunity for a short, passion-based research project! Simple criteria (i.e. “identify two articles and/or text-based sources and one video source that discuss the same topic in different but meaningful ways”) can go a long way. The other added benefit? A class of twenty students will yield twenty usable research synthesis tasks for their peers to engage with! Sign up to receive free lessons that teach these skills in cutting edge and highly engaging ways – in your email, all year round!